Christmas, that one and only festival which now the whole world celebrates with equal elan and enthusiasm. There is something exciting and charming about this festival. I don't know which excites me more, the Christmas tree, or the red color or the Santa Claus or the reindeer or the baking involved with this festival. Anyway, the year is almost an the end phase and within a week Christmas night will knock our door. 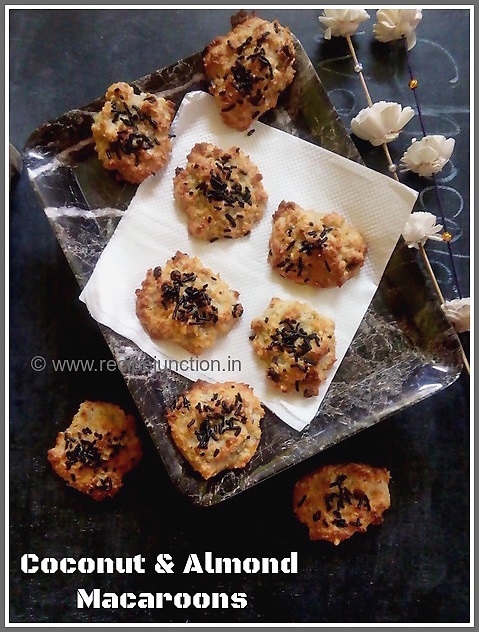 Macaroons are small circular biscuit, typically made from ground almonds, coconut, and/or other nuts or even potato, with sugar and sometimes flavorings (e.g. honey, vanilla, spices), food coloring, glace cherries, jam and/or a chocolate coating. Some recipes call for sweetened condensed milk. 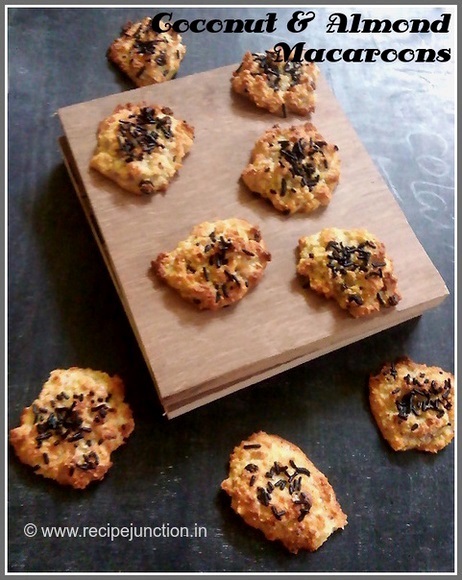 Macaroons are often baked on baking paper placed on a baking tray. 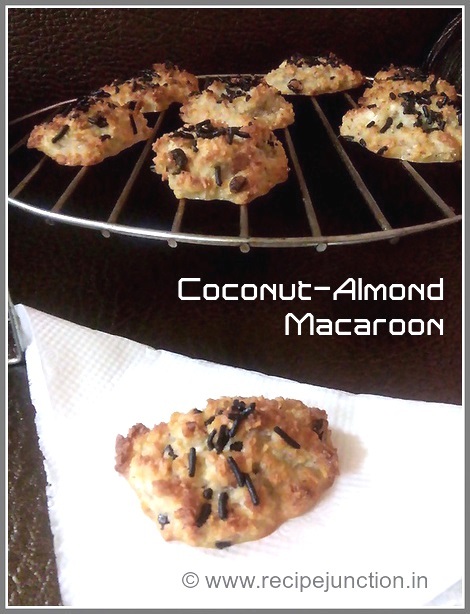 It's a little diffrent type of cookie, with no butter and very less sugar added, only coconut, almonds and the egg whites play the main roles here. This is eggless and even condensed milk free, which I do not like in my food and also butter free. So this was the perfect recipe. Just mix all the ingredients carelessly and drop on baking paper and you are done. But You have to follow the recipe carefully otherwise I can't guarantee. If you are using less or more in quantity, adjust the ingredients proportionately. Do not misunderstood it with Macaron, they are not at all similar. All-purpose Flour : 2 tblsp. Vanilla extract : 1/2 tsp. In a small bowl, combine the coconut, sugar, flour and salt. Separate the egg whites and yolk. Add only egg whites into the batter and vanilla, mix well everything. Preheat oven to 160 degree C/325 degree F. Drop by rounded teaspoonfuls onto greased baking sheets one inch apart. 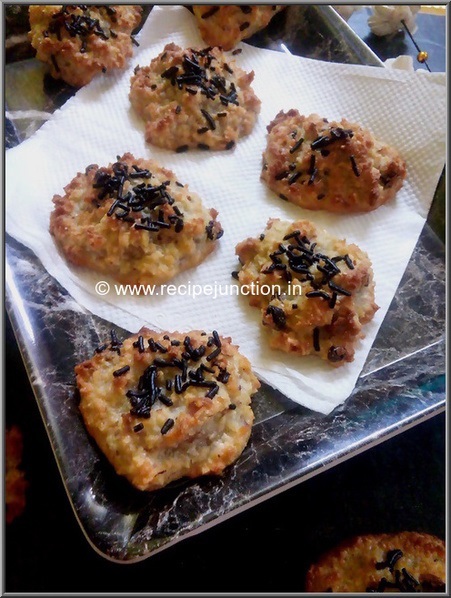 If you wish to decorate them with chocolate rice , then sprinkle over the macaroons. Place on middle rack and bake for 18-20 minutes or until golden brown. Cool on a wire rack. HAPPY HOLIDAYS , EVERYONE !!! ENJOY THE FESTIVE SEASON THE FULLEST AND WELCOME THE NEW YEAR WITH AN OPEN HEART !! !